This is a GREAT summer activity for your little ones. As you can see, Keri and I have a LOT in common! We are both moms to three (two boys and a girl). Both our firstborns are named Jack! I've also loved getting to know her through the monthly link-ups we have. She is the organizer behind all of those! Also, wanted to let you know that we are having a Blog Hop in August to celebrate the beginning of school! Are you anxious about school? Read for it to start? NOT ready? If you come back on August 5, you can hop from one blog to another to get ideas as you prep for school! There will be inspiring ideas and helpful tips! We will be having a GIVEAWAY! Details to come next week! 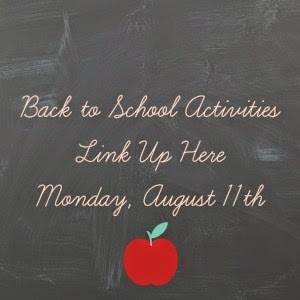 The very next week we will be having a Link-Up Party as well for Back-to-School ideas! Lots of fun stuff coming in August!